Revel brings new speaker systems to CES 2017 | What Hi-Fi? These luxury hi-fi products include the Revel Concerta M8, some new additions to the Performa3 Be range, and the No.515 turntable. Revel has announced a range of luxury products at CES 2017, including new speakers and a speaker system. The speaker system, the Revel Concerta M8, is a pack of compact speakers for use in a two-channel system, the M8 SP2, or in a multichannel audio system, which includes four satellite speakers and one centre channel. The wall-mountable speakers have a couple of 75mm woofers, a 25mm tweeter, and a bass reflex enclosure with dual front-firing ports. Revel also has a new subwoofer, called the B8, which can be added to the system for low frequency effects. The B8 has a 20cm down-firing driver powered by a 200W root mean square (RMS) amplifier. 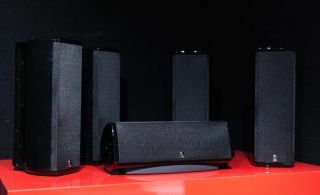 The M8 system is available in black, white or red, and the B8 speaker is available in black or white. Revel has also unveiled a pair of concept loudspeakers as part of the Performa3 Be range. Based on the F208 and M106 models, the F208Be three-way floorstanding speaker (above) and M106Be two-way bookshelf speaker feature Deep Ceramic Composite (DCC) transducer technology and the latest in waveguide geometry. It sounds technical, but Revel claims it means these speakers have better transparency and detail in their high frequencies, from the 25mm beryllium dome tweeter. The F208Be has a 13cm driver for the midrange, and two 20cm woofers for the bass - with a frequency range of up to 40kHz. The M106Be has a 17cm cone woofer to accompany its tweeter. Both speakers are available in walnut, black, white, and beryllium metallic finishes. While there is no word on the prices yet, we are guessing these products will only be of interest to people with serious money to burn.